Sobek was among the oldest deities named in the Pyramid Texts, the texts inscribed on the walls of tombs. He was the lord of the crocodiles and was depicted with a crocodile head. Some ancient Egyptian sects believed that Sobek created order in the universe and the world when he arose from the “Dark Water” and that he was the creator of the Nile River. He was often associated with fertility. Sobek was revered for his ferocity and quick movements; however, he was an unpredictable deity, as were his crocodile counterparts, He was sometimes associated with chaos. The people of ancient Egypt worshiped Sobek in order to appease both him and crocodiles in general, and also to ensure the fertility of their people and crops. 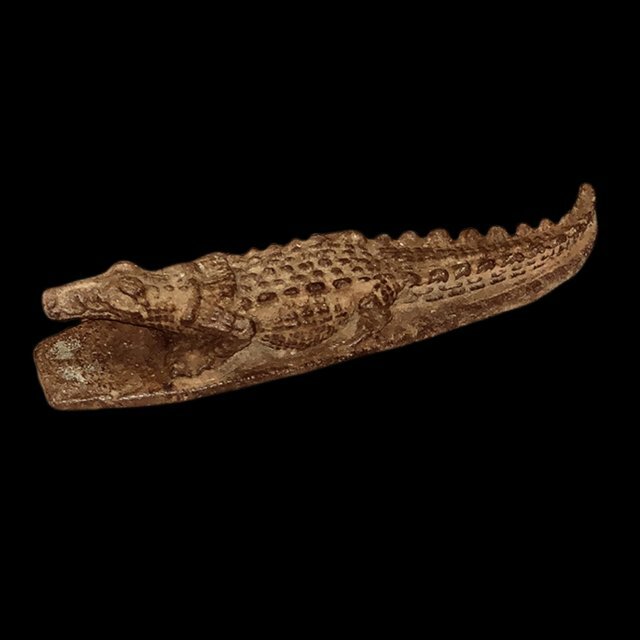 Many mummified crocodiles, of all ages and sizes, have been found in Egyptian tombs. Sobek was associated with both Seth, his father, and Horus, whom he helped birth. He was also considered to be the army’s patron because of his ferocity. Image: RC 28 Crocodile Lamp, Rosicrucian Egyptian Museum.